As part of my studies for a Doctorate in Materials Science I am involved in a variety of Scanning Transmission Electron Microscopy (STEM) projects. One of the advantages of using the scanning transmission electron microscope (STEM) is that it can simultaneously collect image data, which can be optically equivalent to conventional transmission electron microscopy 1, as well as several other analytical signals. These can include energy dispersive Xray (EDX) or electron energy loss spectroscopy (EELS) at high resolutions 2,3. However unless the instrument, or microscope suite, is extremely stable (no probe wobble / scan noise) and there is no specimen drift (no image shear) then careful intepretation of the recorded image may be required. To this end I have developed a piece of image analysis and restoration code that determines the presence of scan noise, probe wobble and sample drift and attempts to correct for these in post-processing. This code, named Jitterbug, has so far demonstrated resolution improvement of up to 16% and signal-noise ratio (SNR) improvements of 61% can be obtained where images have been affected by these effects and restored. Quantitative HAADF STEM, where recorded images are expressed on as scale of fractional incident beam-current is a rapidly developing research field. Such images can be compared directly with image simulation for comparison of sample thickness and/or composition on a now absolute scale. Recently in the research group we have developed an approach of atomic column integration that yields an absolute cross-section for electron-scatterring to be determined that is highly robust to the experimental imaging parameters. This image analysis is performed by a new piece of MatLab™ code called Absolute Integrator that is available for free download to academic / non-commercial users. For annular dark field STEM the incoherent transfer function is expected to be a monotonically decreasing function with increasing spacial frequency 4. However previous literature has shown that in the presence of lens aberrations this may not be the case and the three-dimensional transfer function takes on a much more complicated form 5. Studying the form of this transfer function combined with focal-series data collection methods has lead to a method of image post-processign that increases resolution by up to 10% and signal-to-noise ratio by over 200%. When comparing STEM images a detailed knowledge of their properties is essential. To this end a piece of MatLab analysis code is being developed which quantifies essential image properties including signal to noise (SNR). Additional functionalities are currently under development including signal to background ratio (SBR), resolution and inter-peak dip. Based on previous work in the in the group here at Oxford by DR. Peng Wang an inovative extenssion of current bright-field scanning confocal electron microscope (BF SCEM) techniques are being investigated. 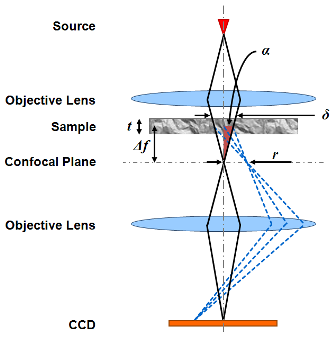 These focus on deploying this technique for the three-dimensional non-destructive mapping of crystal location and orientation in thick (upto 1µm) 6. Advanced microscopy and high resolution imaging requires extremely stable instruments in purpose built suites. An interest of mine is measuring and location any sources of mechanical, electrical or magnetic disturbances on and around microscopes. 1) Cowley. Applied Physics Letters 15, 58 (1969). 2) Muller et al. Science 319, (2008). 3) Kimoto et al. Nature 450 (2007). 4) Nellist, Hawkes & Spence. Science of microscopy Chapter 2 p.89 (2007). 5) Loane, Xu & Silcox. Ultramicroscopy 40(2) (1992). 6) Wang et al. Ultramicroscopy 1-10 (2010).